Newcastle goalkeeper Tim Krul has been ruled out for the rest of the season with a severe knee injury. 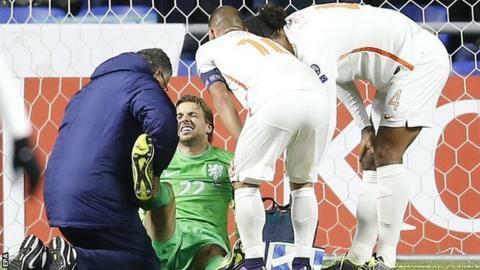 Krul ruptured an anterior cruciate ligament in his right knee during the Netherlands' 2-1 Euro 2016 qualifying win in Kazakhstan on Saturday. The 27-year-old will return to Tyneside for further treatment, his club said. He posted on Twitter: "I'm devastated the scan has confirmed my biggest fear . . . My recovery and hard work starts now to fully recover." Krul has played all eight Premier League games this season for Newcastle, who are bottom of the table and without a win. Back-up goalkeeper Freddie Woodman has been recalled from a loan spell at League Two club Crawley Town.